A piece on Streetsblog makes the policy argument for distance-based transit fares. They actually use Portland’s Fareless Square as part of their argument, apparently unaware of recent history. I generally support this line of argument, at least from a pure policy policy point of view. TriMet has argued that one of the pragmatic reasons for a flat fare is easier electronic ticketing. That’s certainly a fair point, but I’m still not sure that it’s the right answer in the long run. And of course I’d argue that the $1 Streetcar fare is in fact a form of distance-based fare policy, given the relatively short distance trips available on the Streetcar. Portland Transport’s transit tools, including the Transit Appliance, depend on the web services provided by TriMet (and NextBus). And those web services at core get their information from TriMet’s dispatch and vehicle tracking systems. Next week’s PSU Transportation Seminar will look under the hood at how those systems work and how they’re being updated for the future. I’ll be there listening attentively! When: Friday, November 2, 2012, 12-1 p.m.
Now on to the gist of things. The Southwest Corridor Plan Steering Committee have agreed to advance a few Bus Rapid Transit and Light Rail options for the Southwest Corridor. BRT seems to be the preferred option of the committee, given the current funding environment; though light rail is being advanced for consideration as well. The primary corridor (for either mode) is Portland to Tigard, with Tigard to Tualatin being the preferred extension–Sherwood is viewed by the committee as not providing sufficient demand to justify high-capacity transit. Reading between the lines; it does appear that “real” BRT, with exclusive lanes, is what is being considered (with the caveat that hard parts might be run in mixed traffic); not BRT-light. (BRT-light is mentioned as an option for Sherwood). Enhancements to WES seem to be out of scope–though if a rapid transit line goes from Tualatin to Tigard to Portland; it’s only a few miles between Tigard TC and Beaverton TC; and a major destination (Washington Square) is right on the way. Ideas dropped from further consideration include mixed-traffic streetcar, and “freeway bus” on I-5. Other commuter rail besides the current WES alignment (such as Sherwood-Tualatin-LO-Milwaukie-Portland) did not get mentioned in the report. When: Thursday, October 25, 1-2 p.m.
Krista’s specific area of interest is Bicycle Transportation. She is currently working on a research project that aims to estimate bicycle miles traveled in Boulder, Colorado and assessing bicycle safety. She previously authored the paper “Automated Bicycle Counts: Lessons from Boulder”. Feel free to check out the Transit Appliance in the lab while there! 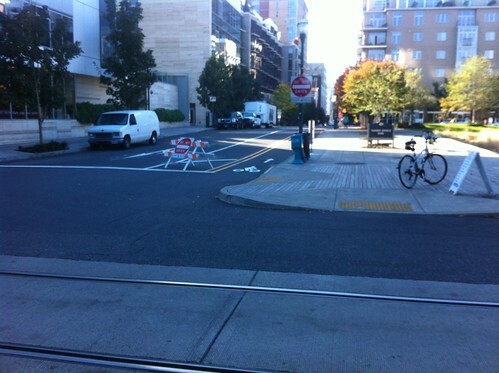 It looks like PBOT took advantage of today’s nice weather to start installing the diverter at NW 10th and Marshall. This is a small bit of mitigation for the Streetcar Loop that is finally being fulfilled. As part of the project we moved the bicycle facility from the now-track-filled-cycling-wasteland of Lovejoy to Marshall St. But Marshall attracted far too much auto traffic to work well for bikes. This is one of several measures to try to win back the street for people on bikes. A concrete diverter should shortly replace the sign, and the buffer area will become parking, while the bike lane will remain curbside. I must say it gave me some pleasure to watch drivers approach with their turn signals on, look quizzically at the sign, turn off their signals and proceed north to Northrup. Let the re-education continue!